Here at the Wedding Scribblers we realise the importance of sending out the right message to your guests when issuing your invites. Below, we have addressed some of the questions, which we come across regularly from our budding brides and grooms. We hope you find this useful and if you have any questions that we have not addressed below, feel free to get in touch with a member of the team at any time. Remember we are always on hand to help! Question: When should we send out our wedding invitations? We find that invites should be sent out 6 weeks to 2 months in advance of your big day. This gives guests time to organise time off work, babysitters, accommodation etc. and will ensure that the majority of your guests are able to attend. If you are holding your nuptials abroad then we would recommend sending the a save the date card at least 8-12 months in advance, you can then send the invites 3-6 months prior to the wedding. Question: Should we set an RSVP date? Yes, always set an RSVP date for your guests. We would recommend asking your guests to reply no later than two weeks before the wedding day. This will give you time to notify the venue of numbers and will allow you to get the seating plan and any other arrangements finalised without too much stress. Question: We want to have adults only at the wedding, is it okay to state this on the invite? Yes of course, it’s your big day and absolutely your choice if you want that day to be childfree. Be aware that this may cause some tension among guests with young children so the wording requires a certain amount of tact. You may find though that a night off from the kids is exactly what some parents’ love about attending a wedding. 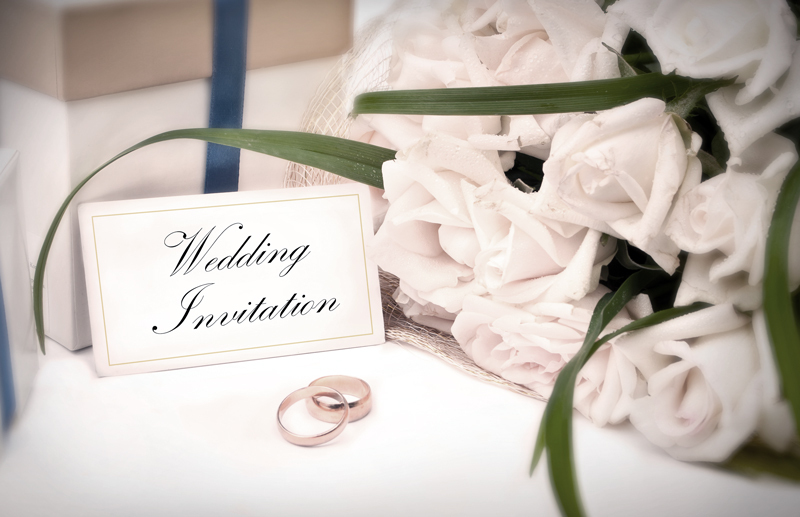 We would recommend that you address the invites for the names of the people you want to invite specifically. It may be an idea to contact friends and family prior to issuing invites to let them know, this will remove any confusion later on at the RSVP stage. Question: We are having a black tie wedding, should this be included on the invite? Yes, any dress code should be included on the invite. We can advise on the wording and placement of your dress code message. It may also be an idea to include details of tux rental shops in the area (who will be happy to provide your guests with a fixed price for block rentals). Question: Is it okay to invite guests to the reception only and not the ceremony and meal? Yes of course! More and more these days we are seeing smaller more intimate wedding ceremonies and we find that guests are very understanding of this. Feel free to invite just close friends and family to the ceremony and meal, and invite everyone else to the big party afterwards! Question: I have a wedding gift list with a store I like, is it okay to include this on the invites? In this case we would advise against providing the details of your wedding list on the invite. You may find that by including these details in your invitation could put some guests under severe pressure financially and could greatly reduce the amount of RSVP’s you receive. Please do remember that requests for cash gifts or the inclusion of a wedding gift lists can be seen as offensive to some.